Cisco MDS 9396S 16G Multilayer Fabric Switch for IBM® System Storage® is one of the highly powerful, dense and reliable Cisco MDS Series switches. It is a compact 2RU switch that can scale from 48 to 96 line-rate 16 Gbps Fibre Channel ports. It is powered by Cisco NX-OS Software and Cisco Data Center Network Manager (DCNM) software. 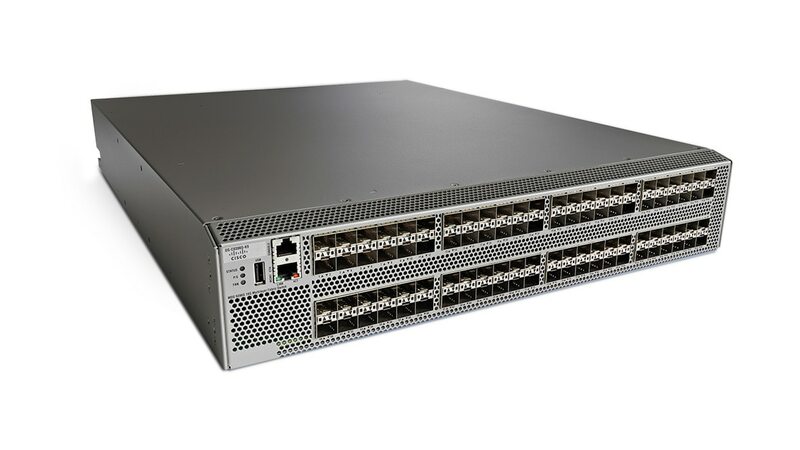 You benefit from reliable end-to-end connectivity because it is compatible with the entire Cisco MDS 9000 Family portfolio. It combines high performance, flexibility and cost effectiveness – along with advanced storage networking functions and ease of management. Get a high-density switch supporting up to 96 16 Gbps Fibre Channel ports in a compact, two rack-unit (2RU) form factor. It can deliver up to 16 Gbps of high-speed, dedicated bandwidth for each port. In-Service Software Upgrades (ISSU) enable the switch to be upgraded without impacting network traffic.